The 1st of September is considered the first day of Spring here in Australia (regardless of what the weather is doing, Australians are stubborn like that). 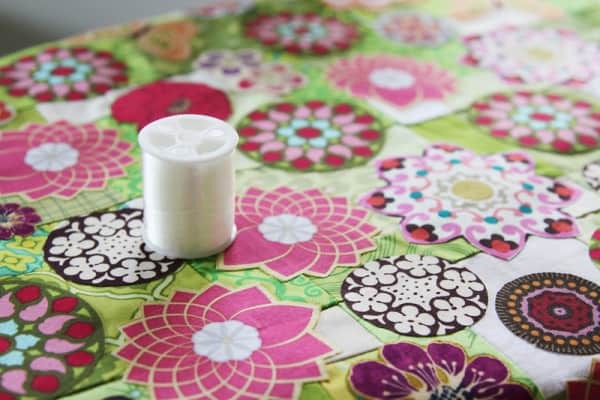 What better way to celebrate spring than with a quilt-full of flowers? This lap sized (51.5″ x 65.5″) quilt is a busy mix of nine-patch blocks and appliqué and is a great scrap buster. I’ve called it Meadow for obvious reasons. The base of the quilt is made from three different sizes of nine-patches, small, medium and large. The amount of green in each nine-patch group also changes – the small blocks are heavy on the green, the medium less so, and the largest blocks have the least amount of green. Once sewn together, the nine-patches are then chopped apart, right down the middle each way. Then you can have fun mixing up their orientation and sewing them all back together again! The large blocks are sewn into a 6 x 2 block formation. The three block formations are then sewn together – small at one end, medium in the middle, large at the other end. Now, they are not exactly the same width – so don’t try and make seams meet when you bring them together, rejoice in the lack of seam matching! You will need to square up a little once the top is sewn, trimming down the overhang. You now have your canvas ready for flowers. I went through my scraps and my stash to find any floral fabrics I had on hand. I sorted them into rainbow order and tried to keep a somewhat even distribution of the colours. Small pieces of double-sided fusible interfacing* were ironed onto the back of each flower, which were then cut out with scissors. Once I had all my flowers prepped I spread out three bed sheets on my tiled floor and lay out my quilt on top. I arranged my flowers as I wanted them and then went through and peeled the backing paper off each one. I gently pressed each flower down with a not-too-hot iron (hence the bed sheets, to protect my floor). Once done I could move the top to my ironing board and give it a thorough press without fear of my flowers moving. With all the flowers fixed it was time to machine appliqué! My method of choice was raw edge. I used transparent filament (here’s an equivalent on Amazon*) to sew the flowers down with my FMQ foot. A note – don’t iron the quilt with a very hot iron after using this in case it melts. Just use one of the lower settings. Lucky that filament is clear because my FMQ was pretty much all over the place (this was my first attempt at free motion). Fortunately, that can’t be noticed and, hey, those flowers are not going anywhere as I often needed 2 or 3 round trips to ensure I got close to all the edges. When all the flowers were appliquéd down I basted the quilt as normal and quilted with a loose wave pattern. The waves are more dense over the flowers and open up out towards the edges of the quilt. For backing I was lucky enough to find a duvet cover with the exact colours and wavy shapes I needed. There was even a European pillow cover included which yielded enough fabric for the binding. There’s no denying this quilt was a lot of work, but it felt good to make something new just from stash. I hope you’ve had the chance to do some sewing, too! *These are affiliate links, which means if you purchase through the link I receive a small, but much appreciated, commission. This is at no cost to you – Amazon pays for it (thanks, Amazon :). These commissions help keep Bonjour Quilts’ website expenses paid, so thank you! And you did it again. Another beautiful design. 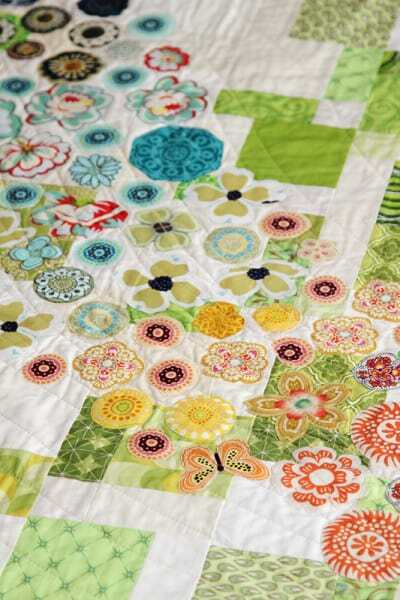 I love the nine patch cut up jobbie and those flowers add such a nice organic touch to the geometric piecing. Bravo! Bon jour Madame, and well done once again! I find the way you conceived and put together the 3 different ‘9 patches’ just stunning. Might give a try myself! My first time here and this Quilt idea is fabulous!! From the mixed up 9 patch blocks to the rainbow applique. You’ve created a real beauty!! Thank-you for sharing. Beautiful sweeping meadow full of flowers in spring; I can almost smell them from here. This quilt is just beautiful! I love the originality and the floral applique. A beautiful quilt – this is a work of art! Thanks for sharing the pattern, now I know what to make with some green fabrics I have. Just gorgeous Kirsty! I love the flowers tumbling across the pretty green background! Love this quilt, Kirst! So beautiful! Oh. My. Goodness! It’s so beautiful! I love this design! The background with the gradient between green and white and the appliqued flowers are just wonderful! Très beau travail, de jolies couleurs. Les fleurs sont elles collées avec du papier double face et pas cousues? En France c’est pour nous l’automne. It’s beautiful Kirsty, and thanks for tip about getting the flowers in place with sheets to protect the floor first. That’s an awesome idea! Absolutely stunning … makes me want to try a similar design using designer papers. This is so pretty, Kirsty! I can see how much work it was to make, but it was definitely worth all of the effort! I hope it’s the beginning of a beautiful spring and summer for you guys! Lovely Springtime quilt. Now all we need is the sunshine. Wow, this is so amazing and beautiful. Love your quilt and what you all did, with blocks, applique and quilting – and to find such a matching backing with binding. A real treasure!! This is a beautiful quilt an it inspires one to try and make one. Thank you for sharing. It is so wonderful when Quilters are willing to share their designs and inspire others to be creative. Thank you. Hi this is the first time I have been on your site and love the idea of appliqué of the flowers on the patchwork quilt. I will have a go at that once I have completed a few UFO’s. Thank you. 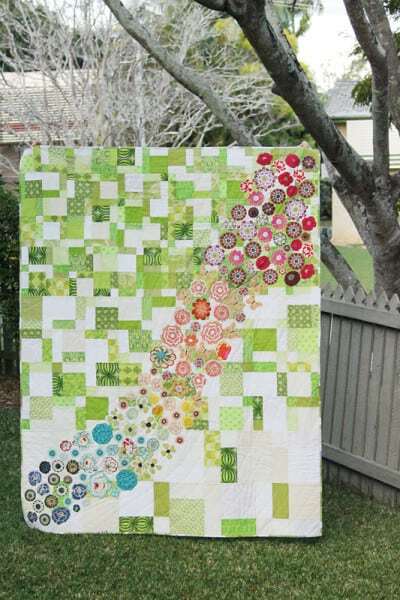 A great quilt for Spring! This is a beautiful quilt! and I love how you used different sized/color 9-patches…I may have to ‘steal’ that idea! I love how those flowers look across the fresh background. Just like they are blowing in the breeze. Great tutorial, thanks. Beautiful look and so creative! Simple, yet stunning. Thanks for sharing! My first visit over to your site, and I am just taken by this quilt. It is so pretty! Simple technique but such a wonderful effect. Thanks for sharing your process! I just found your blog and this quilt is stunning! It does sound like a lot of work but it is a real beauty and worth all the time you put into it. Thank you Beth! It was a lot of work but it helped that I completed it over several months, in fits and bursts. I think if I’d sat down to make it from beginning to end in the one sitting it would have defeated me! I like this quilt! First time I sae it, it has made me think of the Milky Way. I’m thinking deep blues & whites backgrounds, especially fabrics with stars and such. Then instead of applique flowers, use stars. Violâ, a cool variation. If/when I get it done, I’ll credit you and share pix. Love the combination of structure and freeform. Such a gorgeous quilt. I’m looking for a Spring quilt to make for our church. This could be lovely if we put together the greens and florals from our stashes. 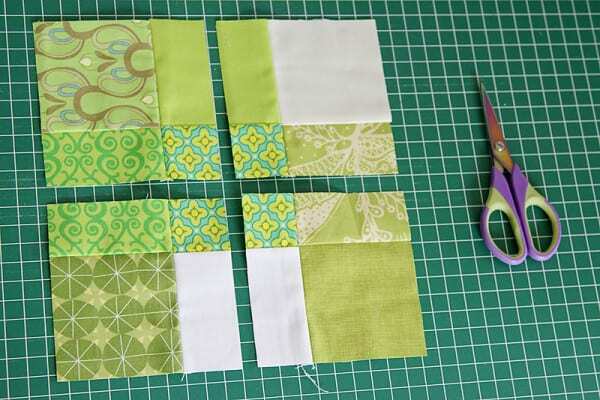 The ninepatch background is not too challenging for different levels of quilters. It is unusual and beautiful. It could be made with autumn leaves or butterflies or birds. Thank you! I am putting it in my list (3rd after the one I am working on) I try to learn something new with each project since I am a beginner. I may change the way it goes together so I can use a quilt as you go method. I especially like that because when you are finished it’s DONE. I just love this quilt. Thank you for a wonderful tutorial. I hope to find tie in the near future to make it!